One of my favorite apps on my iPhone is the NPR podcast app and I particularly enjoy listening to the in-depth stories on my time, rather than trying to tune in when they are live or reading the stories later. I also download other podcasts using iTunes or Stitcher, but in some cases have found either my attention span is too short or that I’m limited in time for the longer podcasts. Recently I’ve only been listening to the 5 minute NPR app’s hourly “newscasts.” Enter the umano app. The app provides an amalgamation of stories from different publishers that are read and recorded by professional narrators that make listening easy and enjoyable. Most of the stories are shorter so multiple stories can be comfortably listened to each time you check in. The categories are picked by the user in order to tailor the type of stories preferred … although I still have found most of the stories are from liberal publications (and my comment is as an NPR radio listener … not just FoxNews). 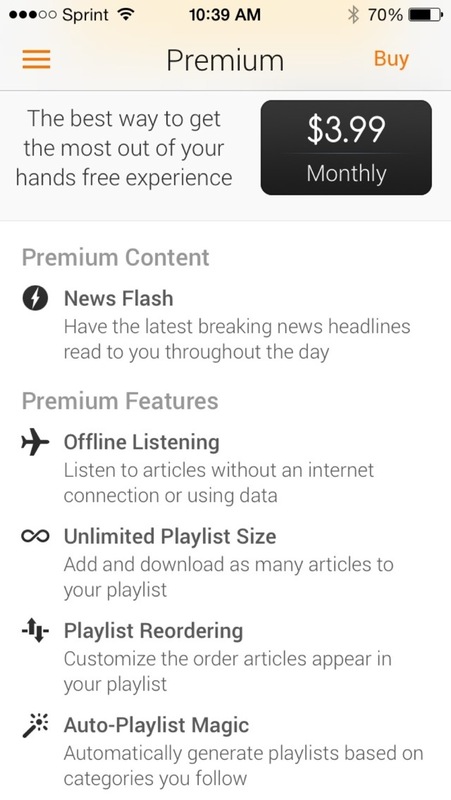 Another optional feature is the ability to “download” stories when away from faster data connections instead of streaming the stories, but this comes with the $3.99/mo premium service along with a few more features (below). Included with the free version is a 2x speed and it is helpful in speeding through slower readers or just as a way to finish off a story. Give the @umanoapp a try by downloading the Android or iPhones app.